I had a great experience visiting France where Isadora Duncan lived many years and created dance! I have visited Paris many times in the past though this was my first time visiting south France. The purpose of this trip was to ‘Pay Homage to Isadora’, my hero. I was so blessed with having my long time collaborators come along from Japan (Eriko pianist, photographer, and videographer) and one of my best dancer Amber from San Francisco. Nice …..get to know the town (visiting Museums, old town cafes, and the Mediterranean Sea) paying a tribute to the city where Isadora Duncan lived the last part of her life (1925-27). Villefranche-sur-Mer …..we were able to give an improvisational performance at a summer house with a beautiful backyard with a view of port. While Eriko played Satie and Debussy, Amber and I danced new site specific works with special guest performer Camille reading the poem of Jean Cocteau in French. The beautiful villa was very close to the petit chapelle decorated by Cocteau in 1957. Villa Kerylos (Beaulieu-sur-Mer)…..amazing afternoon in this Cote d’Azur villa. Beautiful arts and crafts from Greece and what a unique building! Isadora must have visited here and I know she have come to swim near here in the Cap-Ferrat. 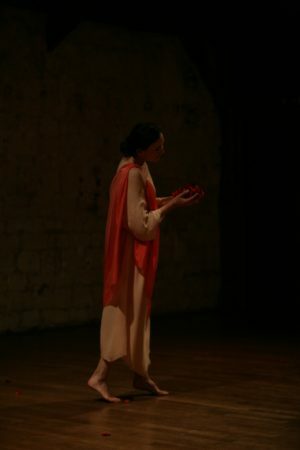 Paris …..teaching and performing Duncan dance (Dancing Dreaming Isadora) at the Studio Le Regard du Cygne for three days. Musique Classique in Archives Nationales …..beautiful old courtyard and rooms in the center of shopping and artistic area of Paris. Performing after the 3 days workshop was the main event of all, and I felt very fulfilled about what we presented. Amber danced solo and duet works with me with such a charm and Eriko played beautifully all these pieces. Some pieces of our Duncan traditional repertoire to the music of Chopin, Brahms, and Scriabin are difficult to play. Four students from the workshop performed in two pieces in the second half of the program; Run Run Leap and the Tanagra Figures. They were very talented and I hope they can continue to dance Duncan in the future! I will list our program and photos of the performance below. I am planing to be back to Paris next year! All dances are from the traditional Duncan repertoire premiered by Isadora Duncan from her early choreographic period (1900’s) to the late period (1920’s). Ajisai by Chopin’s waltz was choreographed by Sano.